Over the years my blog has had a few design/layout changes, I'm sure you've noticed. I've also had many people email me about my layouts, wanting to know how they were designed and who helped me? I'm so grateful to say Ana Degenaar has been my go-to for all of my design and coding needs. She's always been my right hand when I've needed help with a widget or need to change/add a function on the blog. I'm telling you, I could sing her praises all day! I value her relationship so much because not only has her help saved me when I was in over my head (many times) but she's been a genuine friend who's truly talented! Being able to come up with a design and having someone to implement it has been extremely helpful in creating a space that represents me, and I could not do it without Ana's help! For my fellow bloggers out there I want to share with you this great resource, her shop! Ana has these simple, elegantly modern layouts that are all so good, it's hard to choose only 1. Her blog as well is proof that she's the real deal. Blogmilk shop makes it easy to choose & download your layout and for those of us who are coding illiterate, this really makes it easy to have something beautifully designed that can be personalized to you. Plus if you find that you still want something slightly off the grid, she does custom work as well. I adore Ana's work as well! I recently moved my blog to Blogger from Tumblr and I must say the allure of using a Blog Milk theme was too good to ignore. The designs are so timeless, and the support is so sweet and kind to work with. I recently bought one of Ana's designs for my blog as well, and yes, it was really difficult to decide. All so pretty, elegant and modern. Agreed! 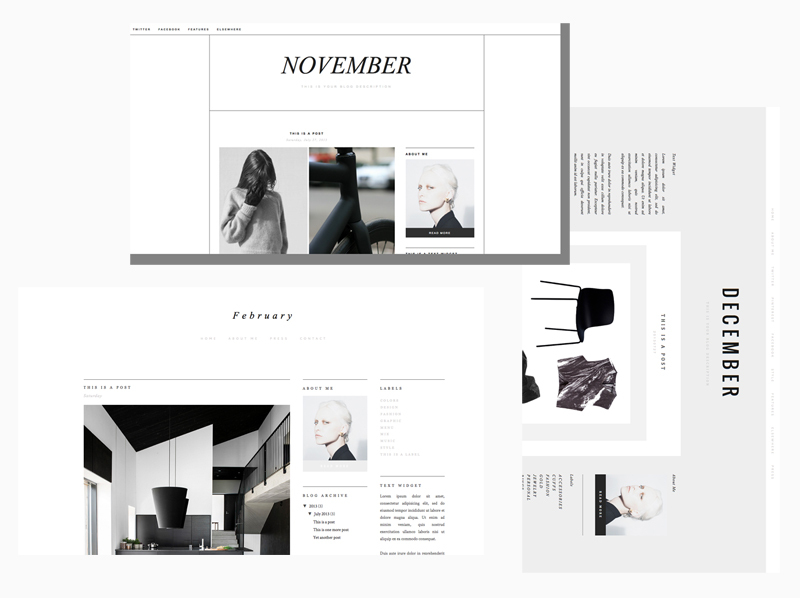 I've tried numerous designers and templates and none are as beautiful and well put together as Ana's. Not to mention, she is always sweet and very professional. Ana's work is exceptional. Minimalism and clean lines defines her artful vision. Muito obrigada, Ana!